The mechanical performance of a fibre-reinforced concrete depends on the anchoring mechanism for each fibre and the number of fibres 'stitching' the cracked section. FIBRAFLEX is fine and highly adhesive so that it does not slip (thanks to its very large specific surface in contact with the cement matrix). This means the fibres are put under tension as soon as force is applied to the concrete and firmly hold the crack from opening. The crack only appears when the force applies exceeds the fibre breaking force (=1 400 MPa minimum guaranteed for each fibre). 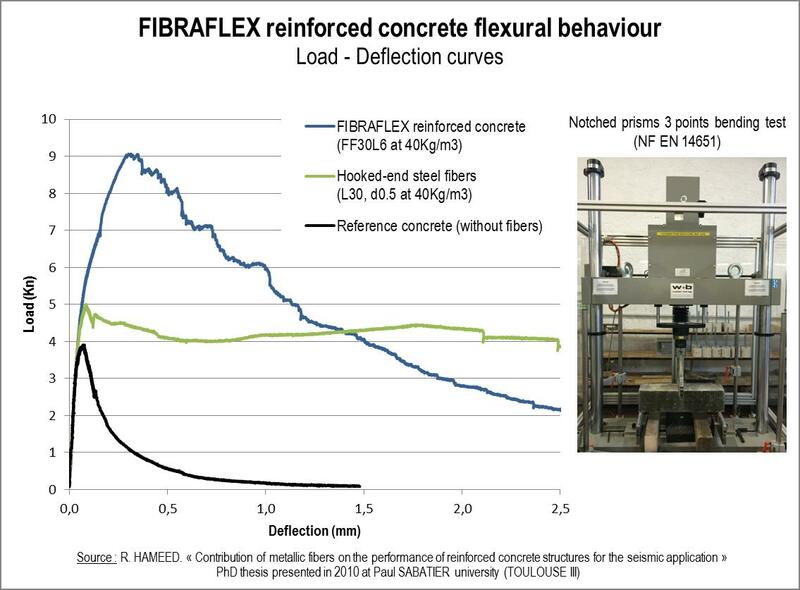 FIBRAFLEX's excellent traction resistance and its very good adhesion to the matrix allows an improvement in the bending resistance and durability of reinforced concrete (prevents aggressive agents penetrating inside the matrix).